As I've mentioned in the past, this is my third winter of Everlane cashmere. The first year I purchased a couple $125 sweaters (my favorite being this cropped cashmere crew reviewed here). 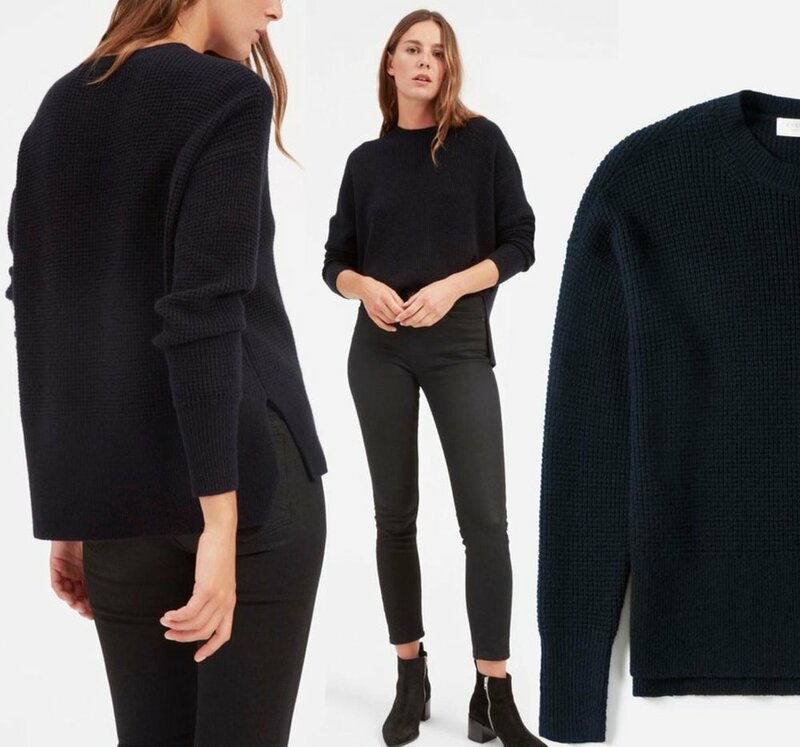 Then last year I purchased Everlane's $100 cashmere crew sweaters (which are awesome but quite boring) as well as the cashmere cropped mockneck (review here) and premium ribbed cashmere (review here), both of which I returned. So you would think I can't possibly need any more cashmere in my life. BUT when Everlane came out with waffle knit cashmere square crew, I couldn't resist! First a note on sizing. The square style that Everlane loves never seems to fit my body very well. I've done square shaped tops and sweaters, and nothing flatters. But since this waffle knit only comes in the square shape I really had no choice. Knowing how oversized the square tops are, I ordered this in one size smaller than my usual (so I got an XS instead of an S). And I actually really love the fit now. It helps that the cashmere is so soft and drapey that it doesn't hold the square shape stiffly (which is the problem I had with some of their square-shaped button down tops that made me feel like I was wearing a sail). Also because I went a size down, the sweater feels a bit more cropped, which I love. I also really love the details of this sweater, from the waffle texture to the split side and split sleeve detail. My other favorite Everlane sweater (the ribbed wool cashmere sweater from last year) that I get compliments on all the time also has this split side detail and I think it helps us petite girls get more visual length to our short legs. The cashmere, of course, is super soft and yummy (more so I think because of the waffle texture). I'm not sure how it will wear (whether or not it will pill more than their regular cashmere sweaters) so I'll update this review in a couple months and let you know. The waffle knit cashmere is more expensive than their regular cashmere, but if you already have one of their $100 cashmere sweaters, I do think it's totally worth it to splurge on this waffled version. The extra texture from the sweater plus all the extra details make it stand out. As usual this review is unsponsored (though this post does contain affiliate links). Thank you again to all first time Everlane buyers who purchase through my referral link for making these reviews possible! And you can find all my other Everlane reviews here (which I recently updated!). P.S. It's been a couple months since this article about Everlane came out from The New Yorker, but if you haven't read it yet it's quite interesting!